(Nanowerk News) Those cute little whiskers you see on your pet do more than just twitch adorably. The long, protruding hairs are actually touch receptors, sending vital information about the surroundings to the brain and helping the animals make sense of their environment. Intrigued by the hairs’ versatility, University of Texas at Dallas researchers used shape-memory polymers to create artificial, electronic versions called e-whiskers, which mimic the properties of the real thing. They describe their work in a paper published recently in the journal Advanced Materials ("Electronic Whiskers: 3D, Reconfigurable, Multimodal Electronic Whiskers via Directed Air Assembly"). UT Dallas researchers said the e-whiskers they developed are a significant step toward engineering electronic human skin. The hair-like structures are a significant advancement toward engineering electronic human skin, according to the researchers who assembled them. “There are some really interesting examples in the animal kingdom of how whiskers are useful for probing and interrogating the environment,” said Jonathan Reeder BS’12, PhD’16, lead author of the study who conducted the research as a doctoral student in the Erik Jonsson School of Engineering and Computer Science. Seals are a good example, he said. Reeder went to work creating his own version of a whisker, along with his doctoral mentor, Dr. Walter Voit BS’05, MS’06. Voit, an associate professor of materials science and engineering and mechanical engineering, is an author of the paper. Outlines of the e-whiskers were cut out from a flat sheet of shape-memory polymer, which is rigid at room temperature but becomes flexible when heated. 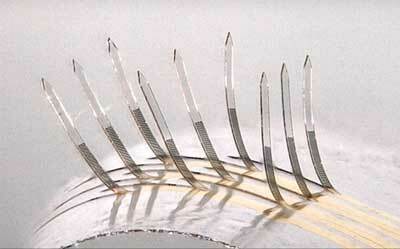 A flexible strain sensor was patterned on top of each whisker, which had about the same diameter as a human hair and remained attached to the sheet. A 3D electronic assembly technique is used to create arrays of multimodal electronic whiskers. A shape-memory substrate enables reversible assembly of 3D electronics via the application of warm air. When researchers blew hot air through the bottom of the cutouts, the material became soft and bendable, allowing the little fingers — or e-whiskers — to rise and become three-dimensional. Once the e-whiskers were assembled, disturbances induced changes in the resistance of the strain sensor that allowed for the precise tracking of each e-whisker position. The researchers said robotics and prosthetics could be two of the biggest applications for the e-whiskers. Integrating e-whiskers with a prosthesis may be more difficult. Ultimately, the scientists would like to not only replicate the human function with prosthetics, but improve upon it.